It was just a few years ago when a friend called to tell me that a video of some tunes I played on a concert was up on the internet, on something called "You Tube". Now there are so many that I decided to try and track them down and link them all from this page. So here they are, in more or less reverse chronological order. Many thanks to those who recorded and posted them. Long Sloping Meadow by James Kelly, w/ John Doyle et. al. King of the Fairies w/Rose Flanagan et. al. Connemara Stockings set w/Dave M.
Planxty Chas. 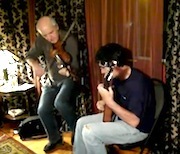 O'Connor / Shaskeen Jig/ Floating Bridge, w/Dave M.
The Humours of Carrigaholt set w/ Dave M.
Copyright © 2012 Randal Bays. All Rights Reserved. Designed by Randal Bays.